Electronic dice offer a fun twist on the world's oldest gaming tool. The description electronic applies to games, components and the dice themselves. Let's see what a little electricity can do for dice! Are you looking for dice that light up or randomly display numbers electronically? Electro Dice randomly display a number when tossed. Each dice lights up and makes sounds. They come in a variety of sizes and colors. You can even put one on your key chain. Use an electronic dice kit for your random rolling needs. You can literally use CMOS circuitry to play games involving common dice rolls. 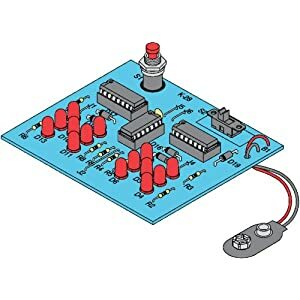 The kit actually provides a nice introduction to electronic components and soldering too. There's another option too. 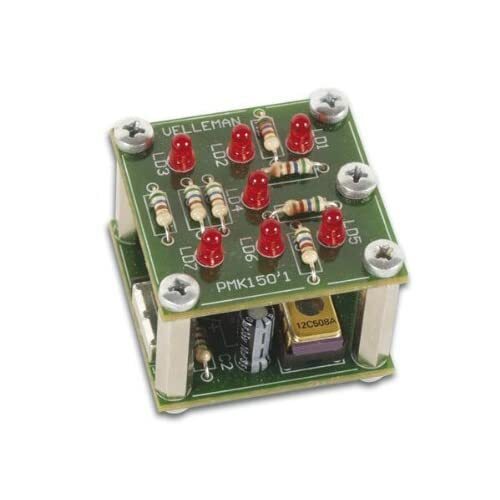 This electronic shaking dice kit has an on/office switch and is controlled by a micro-processor. Popular dice games have also gone electronic. With a handheld, battery operated dice game, players can take the game on the go. The Yahtzee TouchScreen Handhleld will help you and your kids get through long road trips. Take a look at another fun electric dice game: Phase 10 Electronic Handheld game. The electronic version of Phase 10 includes BOTH the card game and the dice game, so you can pick your favorite. Of course, dice make a fashion statement too. You can add lighted dice balls to your clothes or costume. Click the picture below for details. Note: The phrase dice electronics refers to car audio systems. You can visit that page by clicking on the link above.